While earning his Bachelors in Cultural Anthropology and Ethnoecology with emphasis on Biocultural Diversity and Traditional Ecological Knowledge (TEK), Jeff became interested in learning deeper, more integrative ways of understanding and interacting with the world in an ethical and ecologically sound manner. Jeff completed his PDC in Austria, and later continued his training and education at the permaculture Research Institute of Australia. Jeff deepened his understanding of Ethnoecology with a Masters degree in Global Sustainability, where he researched how trees and forests impact public health and address environmental justice, while mitigating climate change and providing vital environmental benefits and services. Jeff has taught and worked with small-holder farmers, NGOs and community-based organizations around the world, mainly in East-Africa and the Caribbean, to create resilient communities and foster healthy and functioning agro-ecosystems. 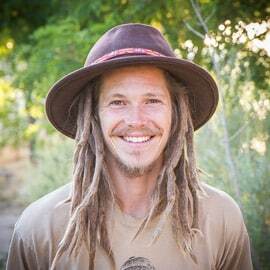 Jeff joined our farm team in spring 2017 after hearing stories about Quail Springs from other Permaculture farms around the world. In addition to playing a key role in teaching at our permaculture design courses and facilitating our Farm and Community Immersion program, Jeff stays busy sowing seeds, working the garden, and tending the food forest.